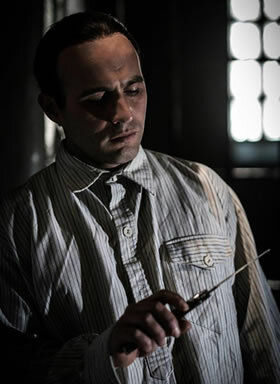 Ahead of the theatrical & VOD release of British gangster movie ONCE UPON A TIME IN LONDON on April 19, actor Roland Manookian reflects on the challenge of playing a young Frankie Frazer, the joy of working with Nick Cave and the tragedy of knife crime. Q: Roland, you play ‘Mad’ Frankie Fraser in ONCE UPON A TIME IN LONDON. Tell us how you got cast and how you approached the role? Just like any other film really, I was asked to read the script and consider the role of “Frankie”. I jumped at it, as the script was really good. It’s a great part and I thought I could do something with the character. Frankie was at the vanguard of a new wave of criminal that was emerging just after the Second World War. Prior to his arrival on the scene killing someone was a capital punishment and meant the death penalty. But Frankie came along, didn’t care because he was essentially a sociopathic murderer, and became the most feared member of Billy Hill’s gang. Q: How much research did you do? Because Frankie was such a high-profile real character I did little research into his private life mainly because I didn’t want to offend his family in any way. I did some digging into post WW1 literature and looked at archived newspapers of the time, as the film is a period piece. I was also keen to look into what was happening socially and politically at the time, where did these men and characters fit into society and what could have led them to lead the lives they did? It was economically a tough time for most. Fascinating. My knowledge of him is just the pre-requisite for any true blue South Londoner”. Q: Frankie Fraser was such a high profile character, with so much mythology swirling around what he did. Was that an additional pressure? I didn’t feel any pressure taking on the role of “Frankie” – quite the opposite actually, I was honoured. What was really interesting for me was the Frankie depicted in the film was a young Frankie, an unknown Frankie. It was a chance to tell a side of his story certainly unfamiliar to me and to the high profile character we know from all the films and media. Q: You’re well known for playing violent men – Zeberdee in the 2004 hit The Football Factory, and Craig Rolfe in the hugely successful Rise of the Footsoldier franchise. Does it come easy? I wouldn’t say it’s always easy, but always so much fun. It can be quite physical and intense. But at the end of the day its acting and everyone usually walks away unscathed and laughing. If it’s done well, all the choreography and staging and doing it over and over is totally worth it. Q: Your break-through role was as the street-wise gang member Justin in Nick Love’s Goodbye Charlie Bright, alongside Paul Nicholls and Danny Dyer. What experiences stand-out? Where do I begin? I was very privileged to be part of that film. I hold Nick Love in the highest respect, such a beautiful man and colossal director. I have the fondest memories and probably one of the highlights was getting my older brothers Quadrophenia CD’s and books signed by Phil Daniels himself, just amazing. Q: What was your upbringing like? Were you a gang member? I had a relatively conventional working class upbringing In South London I guess. I played a lot of football and hung out around the flats. And no, I was never part of or a member of any gang, unless you can call the Scouts a gang. I’d done some acting at school, but it was only when I finished school and college and decided to go and study performing arts, that I really started to understand what professional acting was about. Very luckily, I got the part when the BBC were casting a project called Storm Damage. From there again, very luckily, I joined a prestigious acting agency and my career began. If I had any advice to give to anyone who was thinking about becoming an actor, I would strongly suggest to go and study acting first, as this will only serve you well in your career. I think the current situation with knife crime in this country is tragic, I feel so much for the victims and their families and what they are having to go through. Very little we can say can console anyone grieving the loss of their loved ones. What we can do to safeguard anyone from these events should and always should be done. Q: What is in the pipeline? Well I’m about to finish the final segment of a film that’s part of the Foot Solider franchise, filming out in Amsterdam. We’ve also filmed in Marbella, which was fantastic, and hopefully that will be out later this year – maybe early next year. I’m really looking forward to the release of Once Upon A Time In London and what the new year has to bring.